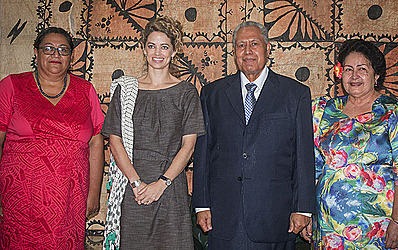 There is a new British High Commissioner for Samoa. She is Laura Clarke, of Great Britain, who presented her credentials to the Head of State, His Highness Tuimalealiifano Vaaletoa Sualauvi II, this morning. The High Commissioner is the UK government’s representative in a Commonwealth nation. They are responsible for the direction and work of the High Commission and its Deputy High Commissions and/or Consulates, including political work, trade and investment, press and cultural relations, and visa and consular services. Ms. Clarke began her career as a House of Commons Group Coordinator at the All Party Parliamentary Sustainable Waste Group from 2000-2001. In 2002 she was employed by the European Commission as a Trainee in the Turkey Team for Directorate General-Enlargement before becoming the Policy Officer at the Mental Capacity Bill team for the Department for Constitutional Affairs from 2004-2005. She remained in the Department for Constitutional Affairs as the Senior Policy Adviser in the Human Rights Division for EU and Council of Europe from 2005-2006; then she left to join the Foreign and Commonwealth Office (FCO) to become the Team Leader for EU Justice and Home Affairs from 2006-2008; in 2010 she became the International Strategy Adviser on Yemen, Middle East and North America Directorate. Ms. Clarke was recently the Head of the South Asia Department and India Coordinator in 2015. Ms. Clarke is married to Toby Fisher with three children.